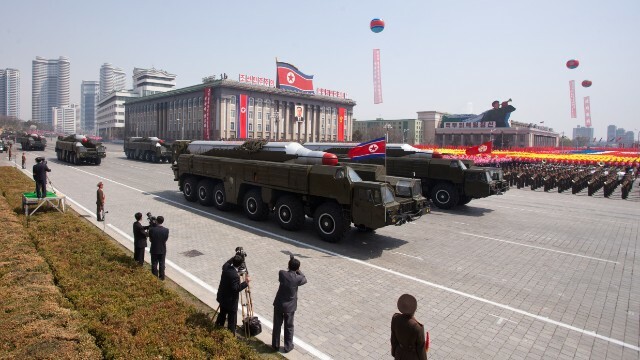 How dangerous is North Korea's nuke capability? A defiant North Korea is threatening both the United States and South Korea in response to the United Nations decision to invoke additional sanctions on Pyongyang for it's rocket launch late last year. Calling the U.S. a sworn enemy of North Korea, the government of Kim Jong Un vowed to launch more missiles and conduct a nuclear test. Pentagon correspondent Barbara Starr looks into how dangerous the North's nuclear capability really is. Satellite imagery of a North Korean nuclear test site identifies what could be key installations that would likely play a prominent role if Kim Jong Un orders a test, which the government threatened to do on Thursday. The analysis of the Pung-gye-Ri Nuclear Test site by U.S.-Korea Institute at Johns Hopkins University’s 38 North blog shows recently completed structures essential to an underground nuclear weapons test. One is believed to be a command and control bunker. Another photo shows what appears to be a radio relay system that zigzags through a valley, which the 38North analysts believe could be used as part of a communications system linking the bunker to the North Korean leadership in Pyongyang. 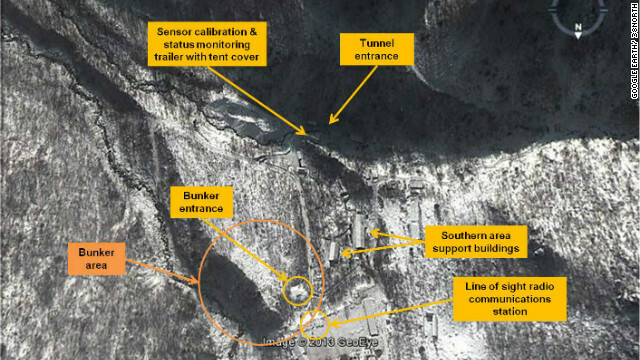 "Located about 150 meters (164 yards) north of the test tunnel entrance, the bunker, used only when a test is about to be conducted, would contain equipment for controlling the nuclear device, managing instruments for gathering test data and communicating with authorities in Pyongyang," the report stated. "The bunker would also provide shelter for all personnel in the area." Residents of Washington may be surprised by a helicopter flying low overhead this week, endlessly prowling the city to map its radiation signature. The helicopter is crisscrossing the city, like a lawn mower covering a lawn, flying as low as just 150 feet off the ground. CNN spotted it northwest of downtown on Monday, flying low over the buildings, back and forth, east to west. The purpose: to produce a baseline scan of the natural radiological readings in the capital. Once the map is done, any new anomalies - or suspicious radioactive activity - could be more easily detected. 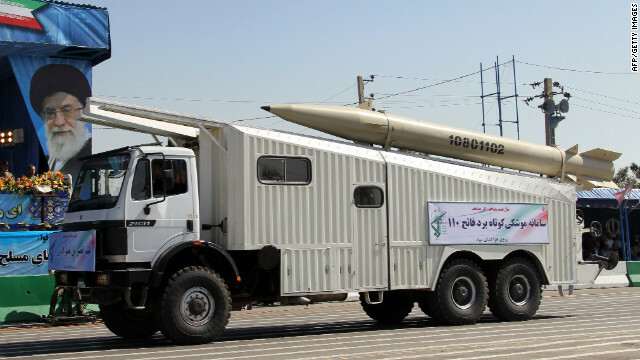 A military truck parades the surface-to-surface Fateh 110 during an annual military parade which marks Iran's eight-year war with Iraq, in the capital Tehran on September 22, 2010. At least nine people were killed in an attack on a provincial military parade, marking the same occasion. The Syrian regime this week fired at least two Iranian-made, short-range ballistic missiles in what appears to be an effort to more precisely target Syrian rebels, two U.S. military officials tell CNN. The Fateh A-110 missiles are more accurate than the older Scud variants that Syrian government forces have used in recent weeks. The U.S. military officials declined to be identified because of the sensitive nature of the information. The Iranian government has not commented on the issue. The Fateh trades range for accuracy. It can travel about 125 miles, while the Scud can go about 185 miles. But the Fateh has a "circular error probable" or - CEP - of 330 feet, while the Scud's CEP is 1,480 feet. CEP is defined as the radius of a circle in which half of a missile's lethal payload falls and is the standard measure of a missile's accuracy. Sources tell CNN’s Barbara Starr that the Pentagon and US intelligence services are consulting with Syria's neighbors Turkey, Israel and Jordan about what to do if it looks like Assad is about to launch a chemical attack on his own people. A senior US official says all the allies are now considering how to keep Syria from putting chemical warheads on its artillery or missiles. But an airstrike to stop it, could cause havoc if residual chemicals escape. What if Assad leaves? US officials say they have long been planing for 'the day after Assad" – such as training Jordanian troops to provide security – but for now they just hope Syrians troops will keep those chemical weapons under lock and key. Syrian forces began combining chemicals that would be used to make deadly sarin gas for use in weapons to attack rebel and civilian populations, a U.S. official tells CNN. The United States obtained intelligence over the weekend indicating this development, according to the official who had direct knowledge of the latest information. The intelligence, the official said, came from multiple sources but declined to provide any more details about how the United states learned of it. Sarin gas, the source said, could most readily be used to fill artillery shells. Syrian State TV cited a Foreign Ministry official on Monday as saying the country would never use chemical weapons on its own people. CNN reported on Sunday that U.S. intelligence is concerned about the Syrian government's intent regarding its vast chemical weapons stockpiles after what one senior American official described as "worrying signs" of activity in "the last few days." 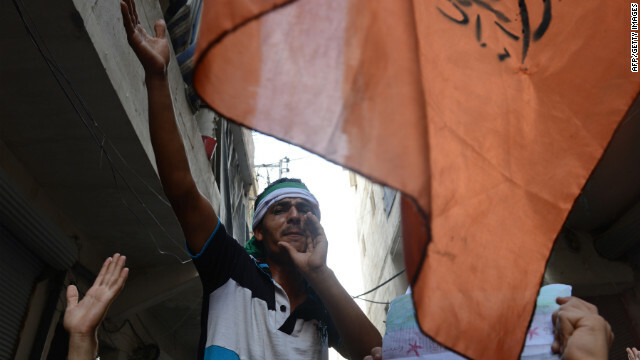 A Syrian demonstrator shouts during an anti-regime protest in Aleppo. U.S. Secretary of State Hillary Clinton warned on Monday the United States was prepared to act if Syria used chemical arms as new concerns surfaced about those weapons, although Syria said it had no intention of using them on its own people. Speaking after meetings in Prague, Clinton reiterated that such a move by the regime of Syria's Bashar al-Assad would cross a red line previously drawn by President Barack Obama. "I'm not going to telegraph in any specifics what we would do in the event of credible evidence that the Assad regime has resorted to using chemical weapons against their own people. But suffice it to say, we are certainly planning to take action if that eventuality were to occur," Clinton told reporters. "There is no doubt that there is a line between even the horrors that they have already inflicted on the Syrian people and moving to what would be an internationally condemned step of utilizing their chemical weapons." Behind every Hellfire missile, there's an actual human being remotely pulling the trigger. But the Pentagon is preparing for the day when robots are capable of targeting and launching a strike on their own. CNN's Chris Lawrence reports on the Pentagon's new rules on drones, effectively forbidding the development of lethal weapons with no human control.